Wooden lobster pots are almost a thing of the past, as metal pots have come into favor. 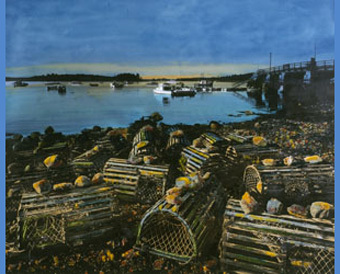 When lobstermen launch the wooden pots at the begininning of the season, they weigh them down with heavy stones until they become water-logged. At the beginning of the season, at low tide, they bring their trucks down to the beach to unload their pots. As water levels rise, the lobstermen bring in their boats, load up the pots and head out to deeper water to set the pots.